Crude oil prices continued picking up a strong bid yesterday printing a high of $54.9 per barrel, a level not seen since November. The surge in prices came after the EIA reported that US imports from Saudi Arabia fell by more than half compared to the previous week to 442,000 barrels per day. Moreover, a broadly weaker greenback and increased supply disruption risks amid US sanctions on Venezuela, remain the main drivers behind the bullish rally in oil prices. 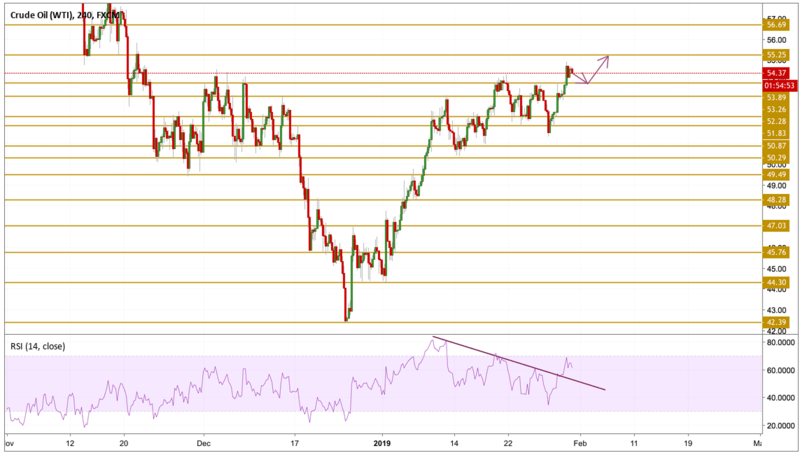 Crude oil prices broke above recent highs towards the $55 handle as expected after momentum picked up some pace to free itself from a declining pattern as we can see on the RSI chart. The price is currently hovering just below the 54.5 level with overbought conditions still far. The next level we will be watching is the 55.25 resistance level.